I have recently learned that there are some people (and by “some people” I mean “my mother”) who have never eaten latkes. I find this pretty much inconceivable. The two women I remember my mother doing social things with when I was small were both Jewish, and latkes have pretty much jumped the Jewish shark anyway and now can be made even by goyim like me. I read a whole bunch of latke recipes, and they all pretty much agree on the critical ratio: about one pound of potato per egg. I used all-purpose flour and a relatively large quantity of onion, and made my latkes small so that there would be a lot of crispy per pancake. And they were pretty good: beautifully browned, crispy all over on the outside without being too mushy or eggy in the middle. If I had a Jewish grandmother, I like to think she’d be proud. Peel the onion and potatoes and grate them, either on the coarsest holes of a box grater or in a food processor. I just grate them both into one pile without worrying about keeping the potato and onion apart. Now you want to get the moisture out. 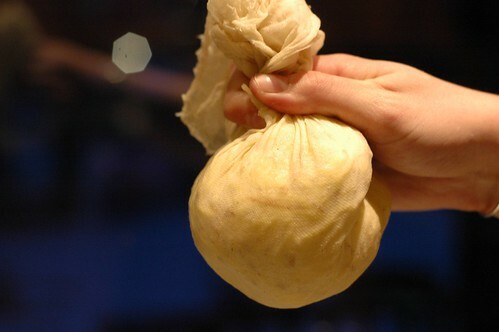 You can do this by putting them in a colander and smushing them down with your hands or a spoon, but the easiest way is to wrap them in cheesecloth and just twist away on the top as the water drips out the bottom. Crack the eggs into a bowl and mix them with a fork to break up the yolks. Then add them to the potatoes, followed by the flour and salt and pepper to taste. Mix well so the flour gets evenly distributed. Heat a heavy-bottomed skillet with a couple of tablespoons of oil over medium heat. Peanut oil is traditional — it takes high heat well — but canola works too. While you’re waiting for it to get so hot it shimmers, line a plate with paper towels. 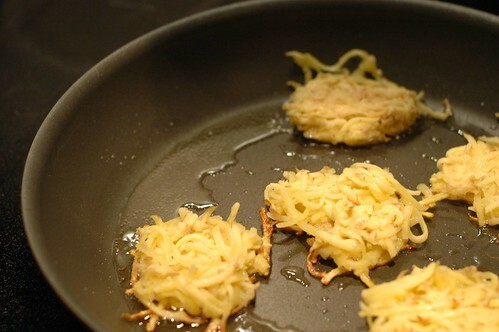 When the oil is hot, drop the latkes in and flatten them slightly with the back of your spoon or a spatula. Don’t pack them in too tightly or they’ll be hard to flip later. Cook until they’re golden brown around the edges. Then flip and cook until the other side is golden brown before removing to the paper-towel lined plate. 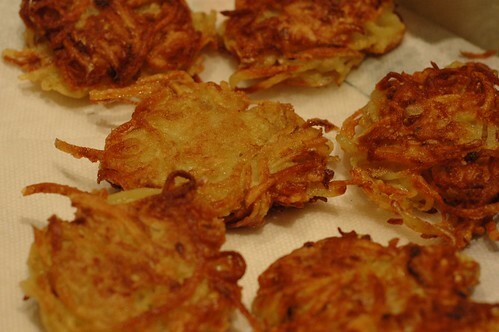 I like them best fresh out of the skillet, but they can be reheated in the oven or toaster oven, either directly on the rack or by placing a cooling rack on top of a cookie sheet and the latkes on top of that. Bake at 400 F until hot and crisp.